in prices of domestic wool during the remainder of 1937.
not likely to be so large as in the same months of 1936.
during the first week of the sales. in quantity, but the decline was checked in July. but has declined gradually in recent months. cents for combing 1/4 blood. average of the last 10 years. mill consumption from the 1936 level. of this year imports of such wool were 25,682,000 pounds. and was the largest for the period in the past 10 years. pared with 5,020',000 pounds in June and 4,957,000 pounds in July 1936.
of shorn wool and 46 million pounds of pulled wool. in sales of wool goods is expected in the next few months. reported in equivalent 54-inch y.ird-a. i Excludes cloths with pile or jacquard decig-n.
in prices in the remainder of 1937.
half of the year is not likely to be so large as in the same months of 1936.
though perhaps not so large as in the first 6 months of the present year. that center will begin September 14. July 26 compared with 8.7 percent on June 21. and. 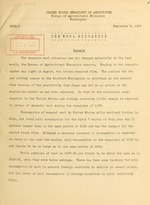 11.3 percent in July 1936.
for the regulation of prices. and Italy -'ere the only other continental countries taking increased amounts. Other countries, including Trance, showed substantial reductions in imports. Market and description : age : age Aug. June :Jul Aug.
Foreign prices have been converted at pr,-vailing rates of changeg. 3] Top and noil in oil. 5/ Average at 10 markets. 6/ 73 per-ent white, at New York. I/ Weight of.greasy,.scoured-and skin wool added together. .
31 weeks.. No adjustment made for holidays. , 4/ Less than.50 inches. : Mil. lb. Mil. lb. Mil. lb. Mil. lb. Mil. lb. Mil. lb. Compiled from reports furnished by American Agricultural Attache' Paul 0. iyhus. :Mil.lb. Mil.lb. Mil.lb. Mil.lb. Mil.lb. Mil.lb. Mil.lb. Mil.lb.